Last year while living in Columbia, I had the great privilege of attending a Bible study led by Stacy, a very Godly woman in my church. What I loved most about the way that she taught was seeing the genuineness and realness of her relationship with the Lord. He really was living and present in every aspect of her day. I enjoyed hearing her pray because she talked to Jesus like He was so many people rolled into one. Sometimes it sounded like she was communicating with her father, sometimes to her best friend, other times to her trusted counselor, and there were even times where if I didn’t know any better, I would have thought she was speaking adoringly to her husband! In the beginning of Matthew 22, Jesus states that the greatest commandment in all the Law is to “Love the Lord your God with all your heart and with all your soul and with all your mind.” Through Stacy’s teachings, through her passionate prayers, through her caring spirit directed towards every lady at those meetings, and through the way she adored her Lord, I got a glimpse as to what that commandment looks like when it’s lived out in daily life. This entry was posted in Faith, Inspiration, Prayer and tagged Faith, Godly woman, Mentoring, Prayer on January 23, 2013 by faithpondering. There are so many times that I wonder why God hasn’t answered my prayers the way I would’ve liked Him to or as quickly as I thought He should. Too often I think I know what’s best for my life and what I need, but I’m not the one who can see the whole picture. There have been times when I have questioned why God never answered a certain prayer that I had, just to realize later why He never did and I go away humming along with Garth Brooks’ song ‘Sometimes I thank God for unanswered prayers!’ God knows me so much better than I know myself and loves me more than I know, so why wouldn’t I trust Him? When I haven’t seen God answer my prayers, I need to remember it is teaching me to wait upon God and to trust Him in the darkness. Instead of letting difficulties draw me into worrying, I need to try to see them as setting the scene for God to gloriously intervene. We need to always be actively looking for what God is doing in our lives. This entry was posted in Inspiration, Prayer, Trust and tagged Garth Brooks, Gifts, God, Inspiration, Prayer, trust, Unanswered Prayer on January 8, 2013 by faithpondering. Divisiveness, half-truths, and partisanship have been the words of note in our elections this year. I wonder what Jesus thinks of this. He experienced all of those things as he ministered on the earth and felt the stings of the words. I just want to say – Lord, please let this be over, please stop the bickering and rhetoric. I was recently reminded of words from Scripture that gives insight into what the priority should be in our political action. Paul wrote to Timothy and said, ‘ I urge, then, first of all, that requests, prayers, intercession and thanksgiving be made for everyone – for kings and all those in authority, that we may live peaceful and quiet lives in all godliness and holiness. This is good, and pleases God our Savior, who wants all men to be saved and to come to knowledge of the truth.’ — I Timothy 2:1-3 NIV. So our political action is to first include prayer for our kings, Presidents and leaders – we are to make requests for them, intercede for them and offer prayers of thanksgiving. Then we are to pray that their decisions would be such that we would be able to live quiet and peaceful lives. Somehow offering those prayers is good and pleasing to God. Somehow, it appears that, when we pray those things it is a testimony to others who don’t yet know Christ or those growing in Christ – it causes them to see and hear truth and gain knowledge in the truth. My Mom was an example of this. She always had a photo of the President of the United States hanging in her home. She prayed for them, no matter what political persuasion they were. I never asked her, but my hunch is that she prayed for their families, their decisions, gave thanks for them and asked that the decisions they would make would allow her family to live peaceful and quiet lives. When our political action first becomes prayer action, God will be glorified and others will gain knowledge of the truth. This entry was posted in Inspiration and tagged action, decisions, God, home, leaders, peace, political, politics, Prayer, president, thanks, truth on November 5, 2012 by faithpondering. We are chosen by God to know and believe Him so that we can be His witnesses and servants. He chooses believers because He loves others! Amazing! His goal is always others. He wants us to tell and show others that He is God!! Through speech and writing and actions. Yes, God loves me, but He loves others just as much. Can we grasp that? Can we see how intertwined our witness and service is to why we are believers? So, find every way you can to know him more and yes, believe Him more. What are some ways? Prayer, Bible study, discussion with other ‘believers’, books written by other ‘believers’. This entry was posted in Inspiration and tagged Bible study, God, Inspiration, Prayer, Witness on October 6, 2011 by faithpondering. I’m thinking of an old hymn this morning as I write this. I deeply appreciate the old hymns because they are so full of such deep meaning. Many are full of theology, some are cries to God for help, many contain Scripture. I also enjoy the new worship songs of this day, but nothing will ever replace the richness of hymns. One of my mother’s favorite hymns and therefore well known to me, because she very often would sing it at home while I was growing up, was ‘In the Garden’. It’s been coming to my mind this morning and I wanted to share it with you; it’s a song about prayer. 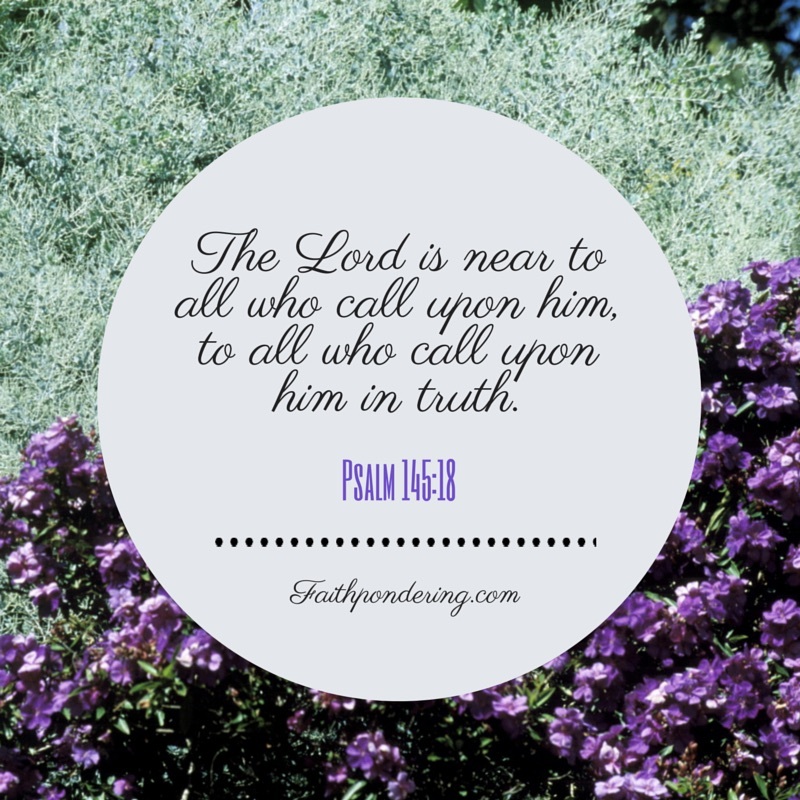 allows us to hear His voice. Let’s find joy as we ‘tarry’ with Him this morning. This entry was posted in Faith, Inspiration, Prayer and tagged Calm, Faith, God, Hymns, Inspiration, Prayer, Reflections on July 29, 2009 by faithpondering.